Why choose Lematec Air tools accessories / Adjustable Tube air blow gun? On one end we fastened a durable brass tip and on the base end we fastened a heavy duty ABS Handle with a solid 1/4" brass fitting. Inside the handle are heavy duty springs, gaskets and pistons. The blowgun was designed to be as ergonomically friendly as possible. The grip fits comfortably in your hand while the angled tip allows for you to get to those hard to reach places easily. Our air gun features adjustable air flow through the easy grip handle offering the amount of air flow when you need it on command. It's actually very fun to operate! Only Ubiquitous Company is an authorized dealer of Lematec air tools and Lematec air tool accessories. Purchase with confidence, simply click the "ad to cart button" to complete your order. HEAVY-DUTY COMPRESSOR AIR GUN : At Lematec, we thought of everything for you so you can concentrate on your work. See yourself using LE-FIG11 Pneumatic Air Blow Gun Compressed Air Tool by Lematec and experience the fun in doing your projects, you won't feel like you are working at all! 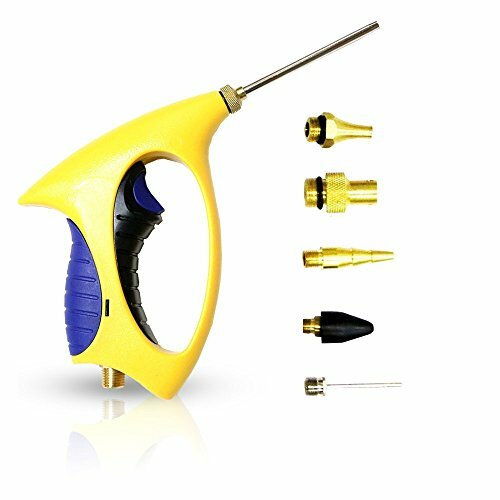 Made from Heavy Duty ABS and tough brass metal air blow nozzle and fittings, this is one of the best blow gun for air compressor. ERGONOMIC DESIGN : Built to bring you the convenience of using an air compressor tool, Lematec has developed this LE-FIG11 Portable Air Compressor tool with an ergonomic design to bring comfort while using. Working on extended hours is not a problem as this compressor ir gun is lightweight and handy. The handle is contoured to ergonomically fit any hand size for good grip. You can easily carry and point to your target area without straining your hands, wrist and arms. ADJUSTABLE FLOW : Unlike other air blow gun with fixed airflow, the Lematec LE-FIG11 Pneumatic Air Blow Gun comes with an adjustable and durable trigger for a minimal air flow to a powerful air blast no dirt can hide even in hard to reach areas! Not only that, it has 6 different Airgun Blower Tips for ultimate air blasting needs and even works well as a compressed air tire inflator! STANDARD SPECIFICATION FOR COMPATIBILITY : The Lematec t LE-FIG11 Pneumatic Air Blow Gun has an ar inlet size of 1/4" male so it can fit any air compressor. The body is made of plastic ABS with rubber O rings, springs and gaskets. Operating pressure is 90 PSI with an Airflow of 2.1 CFM at 100 PSI. RISK-FREE MONEY BACK GUARANTEE : Only Ubiquitous Company offers certified Lematec air tool accessories at a discounted price. We stand behind the craftsmanship of all our products. If for some reason you are not satisfied or malfunction occurs, simply contact us and we will replace your air gun / air blower at no additional cost to you. If you have any questions about this product by LE LEMATEC, contact us by completing and submitting the form below. If you are looking for a specif part number, please include it with your message.